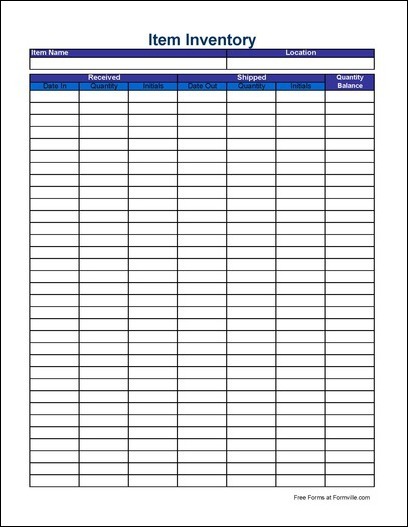 Form Description: Keep track of all the inventory coming in and going out in one place with this handy form. Includes the item's name and location at the top. The main body of the form has sections for inventory being received and inventory being shipped with date, quantity being received or shipped, and the initials of the person making the transaction. Each line also includes a space for the current balance of inventory on hand, so you always know just what you have. This form is in full-page portrait format. You can download a PDF version of the "Simple Item Inventory Sheet (Tall)" form absolutely free. You can also, for a small payment, download a fully editable version of the form that you can customize as you desire. (Don't know which format to choose? Here's how to make your choice.) What would you like to do? Formville's free "Simple Item Inventory Sheet (Tall)" form is associated with the following keywords: inventory tracking, inventory use.